If you read regularly, you will know that we are big fans of home tech equipment, particularly that which looks smart and stylish. Recently we’ve been testing out the LG Music Flow System from Currys, putting it through its paces and seeing how it looks and works for us, in our home. The idea is that the LG Smart Hi Fi Audio system, or Music Flow, allows you to stream music seamlessly around your home, in HD quality, controlled through the Music Flow App. We were really excited to give this a go. It looks really sleek and contemporary in design, pretty standard though I’d say, but good all the same. Currys sent us 3 different components to allow us to test the system fully. 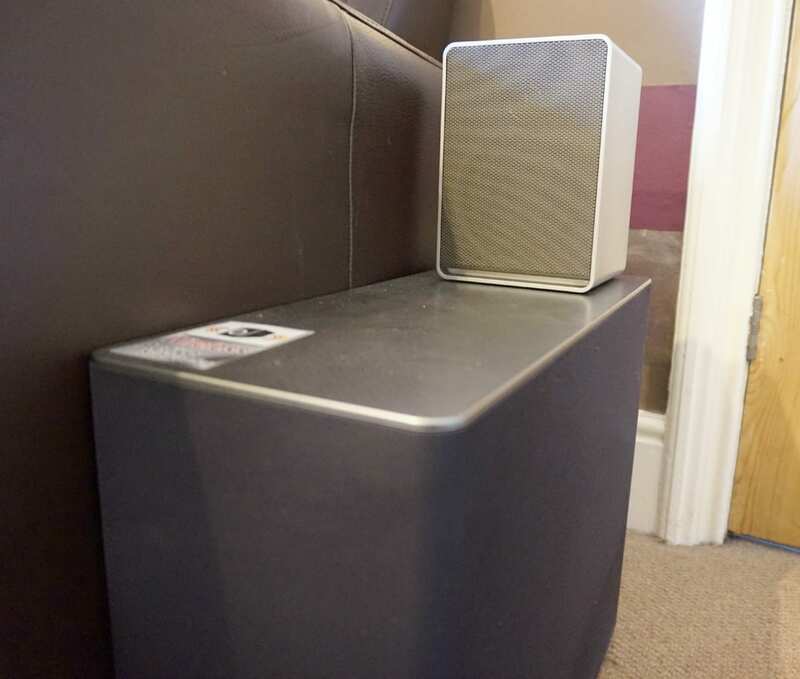 Firstly, 2 x LG H3 Wireless Multi Room Speakers which allow you to play your music via the Music Flow App over WiFi, or via a bluetooth connection. Situate these throughout the home for seamless, streamed music. (I guarantee your teenage children will love you forever!). To enable this feature fully, you need to add an LG Music Flow R1 Multi Room Hub, which acts as a bridge to connect the speakers over WiFi. Secondly, we’ve been using an LG HS6 Wireless Sound Bar to create the full home cinema experience. Connecting this to the tv, together with the Multi Room speakers create an incredible sound to our viewing. Ok, so personally, we found this to be very tricky. Perhaps this kind of technology is just too new to us, but we’re pretty tech savvy, yet it wasn’t quick and easy. After several goes at connecting to one of the speakers over wifi, via the app, I finally got the hang of it. Instructions from LG aren’t particularly clear or plentiful, so you need to use some initiative here. Download the App -> Walk through the App setup -> Enable wifi on the Speaker -> Select the Music Flow connection on your network settings -> Switch back to your normal network -> Wait while the speaker tries to connect. We found it timed out more often than not, but once it does work, the app downloads fully and gives you access to your full music library across your home network. It will sync up new music too, as and when you ask it too. Furthermore, there’s even access to a streaming service with multiple radio stations of all different genres. The Speakers look great. They’re heavy, but small and minimal, and would look good in any room. They’re certainly not intrusive. The sound is great too. It’s full HD, and has the capacity to be very loud! Much louder than we can use in a semi, and with children, but perfect for parties and larger homes. What I love about the system is the ability to use over wifi, rather than bluetooth (although this is great too) and so there’s not loss of, or interruption to your music playing. The Multi Room hub, again is unobtrusive, and a very small component to the system. Plug it into your router, and then set up the speakers, via the Music Flow app to connect to the hub. It allows uninterrupted access to your music across the speakers. To create the full home cinema experience, you can add the incredible LG Sound Bar. To begin with, we didn’t connect the speakers as the sound bar was adequate on its own. Connected to the tv, with the wireless subwoofer situated on the other side of the room, it delivers a beautiful, clear and crisp sound. There are full technical details on the website, but one thing to note is that the sound bar only has one HDMI input, so we’ve not been able to connect our Blu Ray player, and need to physically change the cables to allow access when watching a blu ray film. One other issue we’ve experienced has caused some frustration, and we’ve still not got to the bottom of it fully (so if anyone knows how to get deal with this, please let us know!). Occasionally, the Sound Bar will switch itself off. It appears to do this every 20 minutes or so, if it’s not been activated before the tv. Now this could be related to our tv, we’re not sure, but it can be frustrating if the children forget what to do. The Music Flow App is quite different to anything I’ve used, and to what I was expecting. It has a minimal, almost basic look, but I love the way you can tell it how you are feeling, and it chooses music for you based on your mood. There are some really nice touches here, which develop over time the more music you play. This is a serious setup for serious music and home cinema lovers. It takes some time to set up, but once there creates a decent sound and a new way to access your music. It’s a very exciting system, one we are enjoying, despite the setup issues and hope to get more use from over the coming months. In terms of pricing, at the time of writing, this full package would cost just over £800. I hope I’ve given you a good idea of how you can access music and sound with the Music Flow system review, and how the App works, but do check out the Curry’s LG Home Entertainment page for more information and the full technical details. I have to update the post following our experiences with the LG Sound Bar. We have now stopped using it after a very frustrating experience where it refuses to remain ‘on’ and connected to our TV. We have persevered for months and months and tried firmware updates, full factory resets and more. Nothing has worked. The bar continues to be flaky and unreliable and I wouldn’t be happy recommending now after prolonged use. 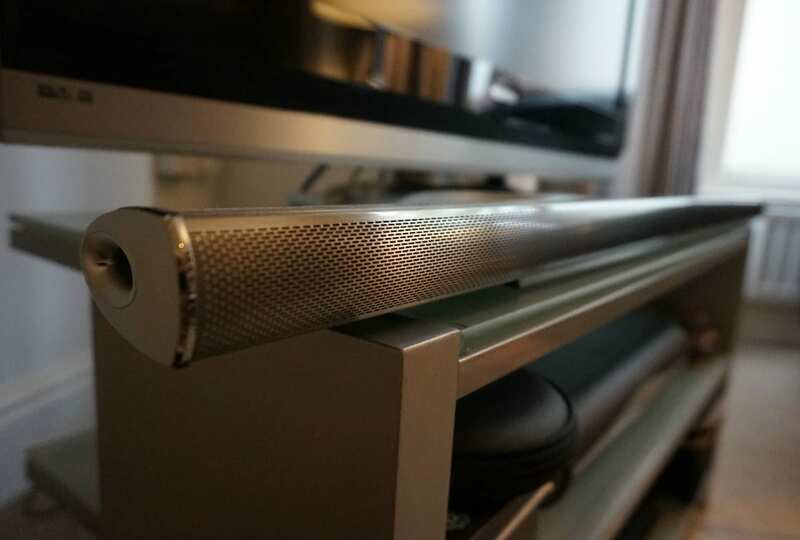 We love having a sound bar and will look around for a different make and possibly a different brand too, but this one has proved very troublesome and we are now giving up with it! Disclosure: We were sent the Music Flow system to use for the purposes of this review. The comments and opinions are genuine and honest. I too am the wife of a man who absolutely loves this kind of thing, and is in constant pursuit of perfect sound. We have similar systems in Kitchen and Living room. I’ve not heard of this one though, I shall be showing my other half this evening! I like full home cinema experience and this LG music flow system is the perfect fit for it. Thank you so much. Oddly I have found your post whilst trying to work out the switching itself off issue. Fully agree with your post and I did think that the wife had commented with the first comment being along the lines of, i don’t get it but my husband goes mad for this stuff. What is your setup, hdmi through from sky box to tv? And what switch on order do you have to follow to avoid the problem. It’s definitely a power saving feature that gets triggered. Back to the kit, its great can’t wait to extend it… But the app and wifi reliability isn’t great. The kit has bugs but thats just software that can be updated. The kits looks and sounds great and I’m discovering more all the time…. Like tapping your phone on the speaker with nfc moves the music your playing to that speaker. Hi Kelvin, thanks for your comment, glad the post was useful. We have finally sorted the powering off issue, have you? It turned out our setup was incorrect, and the sound bar believed it had not feed, hence the powering off. I’ll confirm the cabling setup, let me check, but basically we just switch on the tv now and everything comes on automatically. We’ve even set it so the volume can be adjusted from our sky or tv remote – no need for the sound bar remote at all. It took some fiddling but it’s been well worth it! Hi Kelvin, I have some more information for you…. At first, I followed the advice given in the setup pamphlet that came with the soundbar, and had an HDMI cable coming out of the source box (SKY) into the soundbar, then a further HDMI cable going on to the TV. This immediately prompted the question, “What about the blueray player?”. To use the soundbar with blueray/dvd or another source, you’d have to swap HDMI cables. With this setup, we had all the problems of the soundbar switching off every 20 mins, or having to switch stuff on in a particular order to get anything at all. The SKY box is old, and has an HDMI version 1.1 output,maybe that has something to do with it. I guess the Soundbar wasn’t detecting any input. After getting hold of the proper manual, I started to use an Optical/TOSLink cable, as used with CD players. This cured the problem with the soundbar switching off, and also allows you to have multiple HDMI sources without having to swap cables. The Soundbar just plays whatever the TV is showing. There was a setting on the TV for the Optical output that needed tweaking. The final set up we have now is using a ‘HIGH SPEED with Ethernet’ HDMI cable (version 1.4) connected between the ARC HDMI connection on the TV and HDMI Out (you might expect it to be the In connection) on the Soundbar. Now we can also control the volume on the Soundbar with the Sky remote (having coded the Sky remote to control the Sony TV). To enable that, you need to press the Info button on the Soundbar remote for 3 seconds. Great review Jen. The LG Music Flow sounds looks like a really good music system. I own a Bose Wave SoundTouch and Harman Kardon speakers, and an Arcam AirDac to top it all ( bought all from Bay Bloor radio ), but I’ve been thinking of expanding to other rooms, and the LG looks like a good bet. Hi Dom, thanks for your comment, you’ve nudged me to make an update to this post. We have LOVED the sound the LG sound bar gives, but have become incredibly frustrated at its inability to stay connected to the tv. We’ve tried all things, firmware upgrades, complete resets and googling issues and attempting fixes but nothing has worked. It is just flaky! It stops working sometimes every 20 minutes and resets itself, whilst other times it will work perfectly for a day or two. It’s been so frustrating that we’ve now just switched it off and are looking for a different better model. So, I have to say I wouldn’t recommend it – if I’d bought it and not been gifted the product I would have returned it. We’ve attached ours to a different tv now, without a sky box…. and the problem still exists, it’s very disheartening. Looks like a great setup, I may try this one soon.. Thanks for sharing this post Jen, really good read! Unfortunate that the sound bar has stopped working though! I really like the idea of multi room speakers, its a step closer to the “Smart House” dream!